Hadrian was born on January 24, 76 A.D. He died on July 10, 138, having been emperor since 117. He counted his dies imperii August 11, although his predecessor, the empire-expanding Trajan, had died some days earlier. During Hadrian's rule, he worked on reforms and consolidated the Roman provinces. Hadrian toured his empire for 11 years. It is claimed Trajan, his adoptive father, had not wanted Hadrian to succeed him but was thwarted by his wife, Plotina, who covered up her husband's death until she could make sure of Hadrian's acceptance by the Senate. After Hadrian became emperor, suspicious circumstance surrounded the assassination of leading military figures from Trajan's reign. Hadrian denied involvement. Mementos of Hadrian's reign—in the form of coins and the many building projects he undertook—survive. 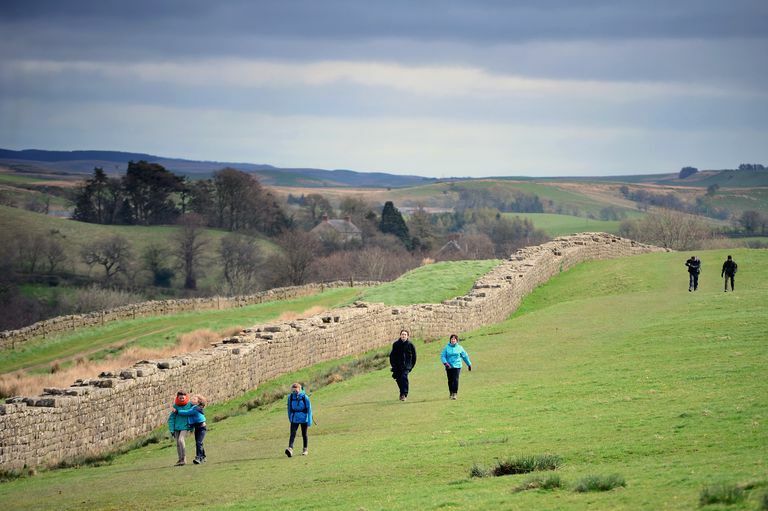 Most famous is the wall across Britain that was named Hadrian's Wall after him. Hadrian's Wall was built, beginning in 122, to keep Roman Britain safe from hostile attacks from the Picts. It was the northernmost boundary of the Roman empire until early in the fifth century. The wall, stretching from the North Sea to the Irish Sea (from the Tyne to the Solway), was 80 Roman miles (about 73 modern miles) long, 8-10 feet wide, and 15 feet high. In addition to the wall, the Romans built a system of small forts called milecastles (housing garrisons of up to 60 men) every Roman mile along its entire length, with towers every 1/3 mile. Sixteen larger forts holding from 500 to 1000 troops were built into the wall, with large gates on the north face. To the south of the wall, the Romans dug a wide ditch, (vallum), with six-foot-high earth banks. Today many of the stones have been carted away and recycled into other buildings, but the wall is still there for people to explore and walk along, although the latter is discouraged. ﻿ Divine, David: Hadrian's Wall. Barnes and Noble, 1995.